The Monoblock Intermittent Motion Assembly Machine is designed for high volume of products, from 5 to 35 million parts per year. The speed of this assembly machine depends on the number of heads being used. 1, 2, 4 up heads are available dependent on requirement. 60 assembled units per minute can be achieved 1-up, 120 units 2-up and 240 units 4-up. The machine is fully automatic which means it does not require manual loading of components or manual process verification. Our intermittent motion assembly machines are available in single or double ring version, depending on the number of required workstations. One ring can contain 12 up to 56 workstations. 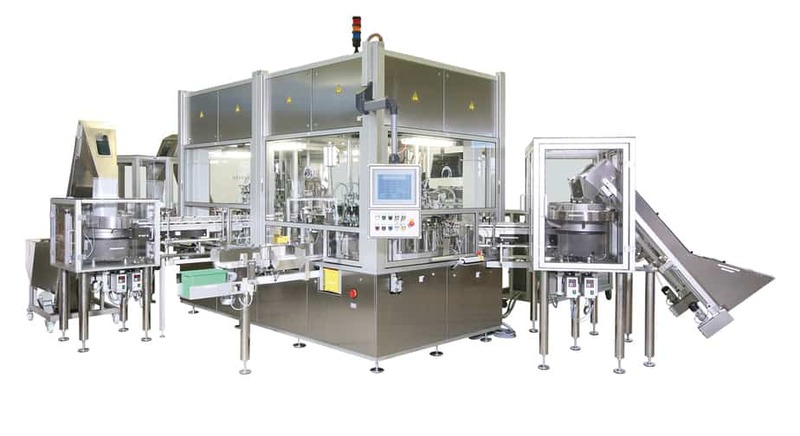 Like the Flexomat machine, our Monoblock Assembly Machine can carry out separate sub-assemblies if required and can form a whole assembly line with other fully automatic intermittent motion assembly machines. We use pucks for transferring components between different machines. This enables quick format change for another product. Some processes require intermittent motion as they are not feasible on continuous motion machines. Such process is Ultrasonic welding, which we can also execute on our Monoblock Intermittent Motion Machine at high speed.